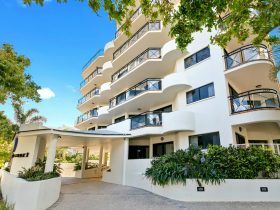 Dockside Holiday Apartments – a small family friendly resort of 1,2 and 3 bedroom self-contained apartments in the heart of Mooloolaba with secure underground parking. With free unlimited wifi. Bring your Apple TV, Chrome cast. The pool, set in tropical gardens, is heated to 28 degrees all year round and the spacious apartments (all with well equipped kitchens, air conditioning and large balconies or private gardens) make a great base for a relaxing Sunshine Coast experience for all ages. A few minutes’ walk takes you to Mooloolaba Beach, patrolled year round and the delights of the Esplanade with its cosmopolitan restaurants and top class shopping. 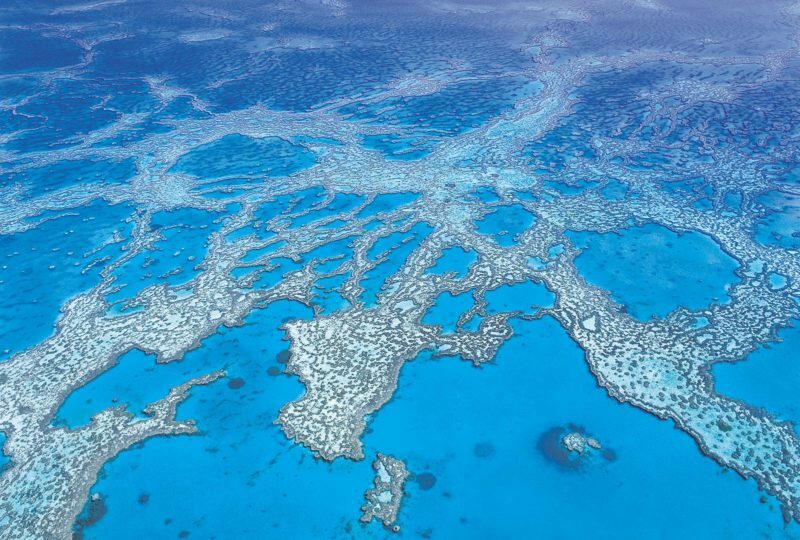 Stroll across to Sealife Mooloolaba, visit Australia Zoo or just chill with a coffee in one of the Esplanade’s award winning cafes. Make Dockside your home away from home while on holiday for a weekend, a week or even a month. Keen bowlers will love how close Dockside is to Mooloolaba Bowls Club and in the other direction the Wharf for all you keen fishermen out there! Call or check the web site for best rates. Please note that Dockside Apartments are individually owned and decor varies. There are no lifts but only three levels. Spacious fully self-contained 3 bedroom apartment with private rooftop area containing a hot tub style spa for guests exclusive use. The apartment has one queen and four singles beds, an ensuite to the master bedroom and separate family bathroom and toilet. The kitchen is fully equipped with oven, hob, dishwasher and microwave and there are also laundry facilities. The apartments have balconies to front and back for morning and afternoon sun. Dockside is within an easy walk to Mooloolaba beach, Underwater World and the Esplanade with its shops, stylish restaurants and cafes. All apartments have some air-conditioning and ceiling fans. The spacious two bedroom apartments contain one queen and two single beds with balconies on the front and rear for morning and afternoon sun. There is a fully equipped kitchen, laundry, two way bathroom and separate toilet. All apartments have some air-conditioning and ceiling fans throughout. Ground floor apartments have an enclosed private patio garden at the rear, with access to the garden, barbecue area and swimming pool. 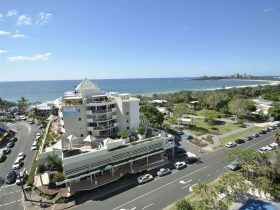 Dockside is within an easy walk of Mooloolaba beach, Underwater World and the Esplanade with its wide range of shops, restaurants and cafes. Ideal for families and larger groups, with ensuite to the master bedroom, second bathroom and separate toilet. With one queen, one double and two single beds. 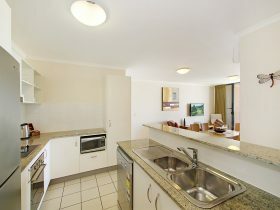 Fully equipped kitchen with microwave, ceramic hob and oven, dishwasher and laundry. Balconies front and rear to capture morning and afternoon sun. 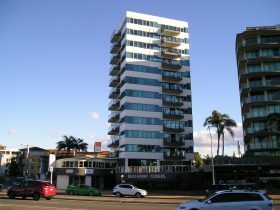 Their spacious 3 bedroom apartments are within a short walk of Mooloolaba Beach, Underwater World and the Esplanade with its wide range of shops, stylish restaurants and cafes. Spacious fully self-contained two bedroom apartment with one queen and two single beds. Private rooftop area with hot-tub style spa for guests exclusive use. Balconies front and back for morning and afternoon sun. Fully equipped kitchen and laundry facilities. All apartments have some air-conditioning and ceiling fans throughout. 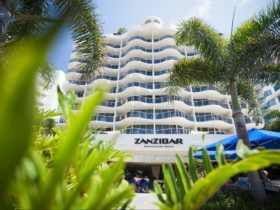 Their apartments are set in tropical gardens in a quiet corner of Mooloolaba, yet close enough to walk to the beach, Underwater World, the Esplanade for a wide selection of shops, restaurants and cafes. Best rates for longer stays – this range covers low to high season one, two and three bedroom apartments based on a seven night stay.